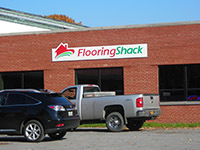 FULTON, NY – Jenn Reebel and Estela Ferlito are the new owners of Flooring Shack in Fulton. They bought the existing business from the previous owner and have been in business for three months. Flooring Shack offers hardwood flooring in a variety of species, grades, finishes and sizes. Flooring Shack is located next door to Timberline Hardwood, a mill. Flooring Shack buys direct from the mill, which means better product availability at a lower cost. This situation is unique in Central New York and quite advantageous for both businesses. If you are looking for something special, Flooring Shack can have your order custom milled to your specifications. Flooring Shack also offers laminate and engineered flooring, floor-care products, decorative floor medallions, and flush-to-floor register vents. On Wednesday, from 4-7 p.m., Flooring Shack will host contractor night. Contractors are invited to visit the showroom to see the selection of all species, grades and finishes of hardwoods, engineered and laminate flooring. A prize drawing will be held at 6:30 p.m.
Flooring Shack is located at 99 Harris St., off Route 481, between Mavis Discount Tire/Cole Muffler-Brake and Bank of America. The building is at the end of the block. Flooring Shack is in the corner, to your left. Flooring Shack is open to the public and welcomes both contractors and those who want to do it themselves. They are open Monday through Friday from 9 a.m. to 5 p.m. and Saturday from 9 a.m. to 1 p.m. Delivery is available throughout Central New York.